In recent years, companies have increasingly turned to large software solutions known as ERP (enterprise resource planning) systems to centralize and streamline their accounting information systems. However, this centralization has caused tension with end users because of the system’s rigid structure and unfamiliarity to employees. While ERP’s are often implemented to enhance internal control procedures, in practice, users often circumvent the controls by removing data from the system and manipulating it separately in spreadsheet software. This practice has become commonly known as Shadow IT in the business press. The persistence of Shadow IT is evidence of its usefulness in business practice, in spite of sanctioned IT systems that should perform the same tasks. Clearly, employees and managers believe that shadow IT practices have a significant degree of credibility. With this study, we investigated whether the type of information system used to produce a report affects the level of perceived credibility given by managers. We developed an experimental instrument that asked participants to compare cost estimates for two different products. 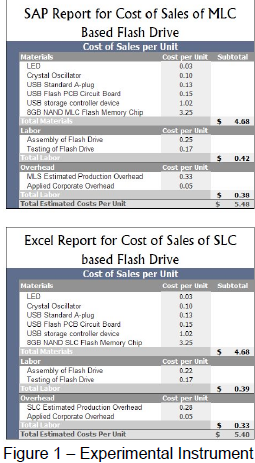 The cost estimates were from a manufacturing company that was considering dropping a certain type of flash drive. 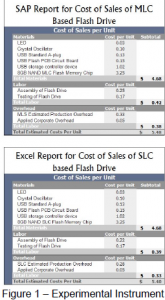 We varied the supposed source of the system (ERP or Manual Spreadsheet) responsible for generating the cost estimates, but kept the rest of the report the same (Figure 1). We then asked various diagnostic questions about the participants’ confidence in the individual estimates. For our participant pool, we solicited workers from Amazon Mechanical Turk, an online crowdsourcing marketplace. This allowed us to efficiently pilot our study and refine certain elements that may not have worked. Another administration of the study to MBA students in the Marriott School is also under consideration. Based on relevant papers from behavioral theory literature, we broke the theoretical construct of credibility down into four parts: completeness, accuracy, likelihood of making mistakes and ability to manipulate data. After presenting the participants the background information to the case and the cost reports above, we asked them to rate each of the two products subjectively along these four dimensions. We found that participants believed ERP systems to be more accurate and be less prone to mistakes and manipulation than shadow systems. Responses for completeness were not statistically different between the two systems. We also asked ancillary questions about which system would be easier to use and learn quickly and respondents replied that Shadow IT would be better in both categories. This is certainly a factor in the widespread use of unsanctioned shadow IT. Although most users recognize that ERP systems likely provide more accurate information and are less likely to contain corrupted data than a manual spreadsheet, shadow systems persist in the business world. This is likely because of employee familiarity with spreadsheet software and the flexibility that it offers. This project has helped me to see how the research process in the social sciences works and has given me hands on experience in academic writing and experimental design. I appreciate the support of my donor, the OCRA program, the School of Accountancy and my mentor, David Wood.